Cosmetic Dentistry FAQ: Is Cosmetic Dentistry a Speciality? 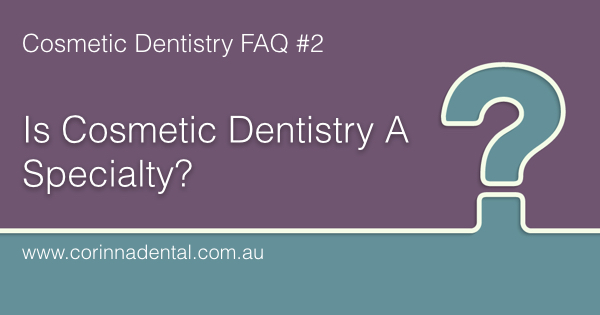 FAQ #2: Is Cosmetic Dentistry A Speciality? No, Cosmetic Dentistry is not a dental specialisation in Australia. There are 13 recognised specialties, all of which require a fully-qualified dentist to undertake several years of additional training at a University. You can see the list of approved dental specialisations below. In Australia, all dentists are taught Cosmetic Dental procedures during their undergraduate degree. Many qualified dentists elect to do additional training in this area by attending lectures and workshops, which may be anywhere between a few hours to a few weeks long. Dentists will often receive a Certificate of Attendance for such courses, but this does not equate to a recognised specialist qualification. To use the title of dental specialist for each of the approved specialties, a practitioner must be registered with the Dental Board of Australia in that specialty.